Nearly 200 students, faculty members, and industry leaders listened with interest as Irwin M. Jacobs, the accomplished engineer, innovator, and businessman who co-founded the global telecommunications company Qualcomm, provided stories and some technical details mapping his career in wireless communications. His April 24 evening presentation marked Northwestern University's 32nd annual William A. Patterson Transportation Lecture. A Fortune 500 company, Qualcomm is known primarily for its contributions to the cell phone industry as a chipmaker and for its innovations in code division multiple access (CDMA), technology fundamental to today’s 3G mobile wireless standards. But Qualcomm’s technologies have directly impacted the transportation sector as well. Short for “Quality Communications,” Qualcomm got its start in 1985, after Jacobs had been working in the electrical engineering field for nearly three decades. In 1968, after a 13-year career in academia, during which Jacobs taught at MIT and at the University of California-San Diego, he co-founded his first company, Linkabit Corporation. The technology company would eventually spin off more than 100 communications companies, including Qualcomm, but not before making significant advances in wireless communications; its projects included VideoCipher, an analog scrambling system for television, and very small aperture terminals (VSAT), a two-way satellite ground station that Linkabit developed and sold to WalMart for employee communications. Jacobs retired from Linkabit after 17 years, but his retirement lasted just three months before he and his collaborators founded Qualcomm. They were armed with lots of knowledge — but as pioneers in an exciting new field, lacked a firm grasp of what products they would create. They soon did. Qualcomm’s first product, OmniTRACS, a communications and asset location system for the trucking industry, launched in 1988. The system provided a means of communication between trucks and headquarters. Trucks were rigged with an antenna that had to be designed to continually point toward a satellite; the satellite sent signals to a control center, which was connected by landlines to trucking dispatch centers. Jacobs also discussed Qualcomm’s advances in CDMA and how the technology has rapidly changed over the years. The company began pursuing CDMA technology in 1990; it took seven years to launch the first commercial system. He noted that in 1991, three chips were required to implement a 2G CDMA modem in a handheld mobile phone; in 2013, a single chip can support 2G, 3G, and 4G modems, as well as a central processing unit (CPU), GPS, graphics, and more. Today, Qualcomm remains on the cutting edge of smart devices and sensors that impact all our lives. 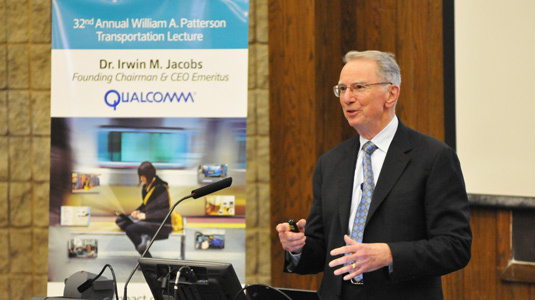 Jacobs dedicated a substantial portion of his lecture to the global work of Qualcomm Foundation, an outlet that uses wireless technology and mobile computing to better lives and communities in the United States and abroad. In rural Whiteville, North Carolina, Qualcomm’s Project K-Nect has provided mobile devices for use in a ninth-grade classroom, demonstrating a marked improvement in standardized test scores. An app designed for fishermen in India shows them what prices they can expect in ports, and a healthcare app virtually links dermatologists with people who need care in Egypt. Looking forward, Jacobs said, wireless technology will continue to push the bounds of communication and connectivity, reinforcing the idea of “the Internet of everything.” Wireless features in vehicles will lead to added safety features, while interactions between biosensors and wireless mobile devices will transform healthcare. Named for William A. "Pat" Patterson, former president and CEO of United Airlines, lifetime trustee of Northwestern University, and co-founder of the Transportation Center, the Patterson Lecture is a focal point of transportation activity at Northwestern. The event has featured industry leaders from Alfred Kahn to Herb Kelleher speaking on the most relevant and impacting transportation issues of the day.